PATH Intl. welcomes our newest Bronze Sponsor, SmartPak. Look for more information soon from our newest sponsor! Please help therapeutic horsemanship by sharing this PATH Intl. video on Facebook or Twitter. Simply sign up on the Giving Library and then share the video. PATH Intl. gets $5 for each share from the Giving Library. Thank you! Do you have a product equine professionals would be interested in purchasing? 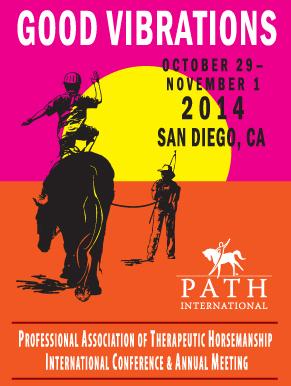 Educational materials, books, videos and jewelry are all great possibilities for selling to the 700+ therapeutic horsemanship professionals attending the 2014 PATH Intl. Conference October 29-November 1 in San Diego. Save $100 off the exhibiting fee by reserving your spot by May 15. For more information, email Megan Ferry or call her at (303) 452-1212, ext. 107. The minutes from the 2013 PATH Intl. Annual Meeting (unapproved) are on the website. Click here to download them. Please remember to submit your annual compliance forms to the PATH Intl. office no later than April 1, 2014. Failure to do so will result in withdrawal of your evaluator status and the ability to conduct PATH Intl. workshops and certifications. Please email Denise Fager or fax to (303) 252-4610, Attn: Denise Fager. The PATH Intl. Equine Welfare Committee presents a PowerPoint presentation webinar on the care and welfare of our EAAT Horses on Thursday, March 27, 6 p.m. Eastern Daylight Time. The webinar is free. Click here to sign up. The presenter for March will be Cathy Languerand. Cathy is a PATH Intl. Certified Registered Instructor, a CHA Master Level Instructor, a Reach Out to Horses Certified Instructor, a USPC Instructor, Reiki Master, and is the PATH Intl. Equine Welfare Committee Chair. 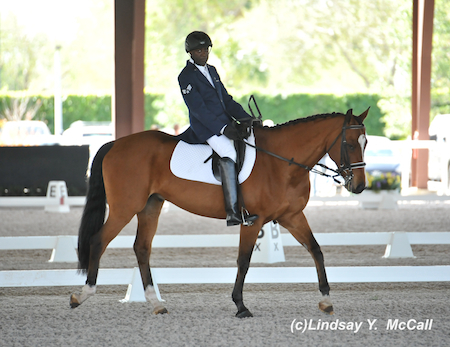 Derrick Perkins, the 2014 PATH International Equine Services for Heroes Equestrian award recipient, recently competed with horse NTEC Hans at the Adequan Global Dressage Festival CPEDI3*. According to the United States Para-Equestrian Association newsletter, "This was Perkins first international para-dressage event and he earned his 2014 WEG qualifying score during the team test in Grade 1a. 'For my first time it felt good. We worked out a few kinks before competition and it ended up being great. I definitely had butterflies but Hans was wonderful.'" Make sure your equine first aid container is clearly marked and that it is routinely checked and the used/contaminated supplies are replaced (monthly). It must be placed in a designated, easily accessible location--in a controlled room temperature environment when possible. Click here to read a few things to have on hand and when to call the vet. Last year, two combat-wounded Veterans, Daniel and Doc, set off on a motorcycle journey across America interviewing researchers, healthcare providers and Veterans, many of whom had contemplated or attempted suicide. Their mission was to raise awareness of the high rate of suicide amongst Veterans and, more importantly, highlight the sources of hope that other Veterans had found. The effort is called Project 22, painfully inspired by the recent VA estimation that 22 veterans commit suicide every day. The film, scheduled for release Summer 2014, discusses post-war challenges for Veterans that lead to suicide and the healing Veterans are finding in alternative ways, including equine-assisted activities and therapies as was demonstrated at PATH Intl. Center Greater New Orleans Therapeutic Riding Center in Louisiana. The 2014 Project Erasmus+ and the 2015 International Federation of the Horse in Education and Therapy (HETI) in Taiwan will both address equine mediation in social education activities. Both are looking for any organization or educator who wishes to present a speech, workshop or poster. For information, visit the HETI website or email Dr. Lucarelli or Peter Edvi, president of the Hungarian Federation of Riding for the Disabled. ACTHA has coined March as "The Shamrock PATH" with a goal of 1,000 Obstacle Challenge trail rides around the country during March. Some rides will still be taking place in April. The event requires only an arena or some open land, and two or three people from your center to manage the event. By becoming a ride host, your center would attract trail riders in your area to come for a fun day of casual competition. You can gain local exposure while earning funds for your center and PATH Intl., as your center will retain a portion of entry fees. To learn more, visit ACTHA at www.actha.us/path to see how this works and how your center could benefit, or call Robin Tilghman, ACTHA's PATH Intl. events manager, at (434) 989-1437.